Start making healthier choices now for a lifestyle of healthy living. 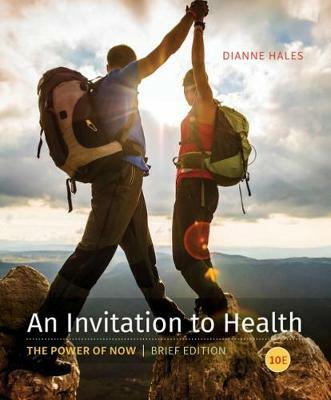 AN INVITATION TO HEALTH: The Power of NOW, BRIEF, 10th Edition, helps you assess your health behaviors, encourages positive behavior change, and gives you effective ways to achieve it. Covering body, mind, and spirit, the book addresses current issues related to health and wellness that can affect you now and throughout your life. The book empowers you with practical ideas and tools that you can immediately apply to your own life. 'Health on a Budget' features demonstrate practical ways you can achieve your health goals in low- and no-cost ways, while 'Consumer Alert' features help you evaluate health care. AN INVITATION TO HEALTH helps you build your foundation for a healthier future.